The Elephant Coast in the KwaZulu-Natal region features a spectacular landscape. You’ll find charming coastal areas, some wonderful game reserves and a fascinating underwater world. It’s a paradise for snorkeling and scuba diving. St. Lucia is the main tourist town in the area. It’s a small idyllic place with restaurants and cafes. 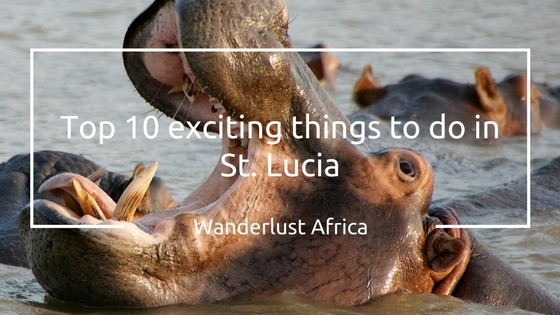 The highlight of a stay in St. Lucia are – among other things – many hippos, that come out from the waters at night time strolling comfortably around the streets of town. Here are top 10 St. Lucia excursions. The iSimangaliso Wetland Park – formerly known as Greater St Lucia Wetland Park – is an UNESCO World Heritage Site due to its five ecosystems with a variety of wild animals and a rich marine fauna and flora. You’ll enjoy this 60 km long flat lagoon surrounded by papyrus marshes, mangroves and swamp forests, a subtropical coastal forest and not to forget, fantastic sand dunes and sandy beaches. A must visit if you love long beach walks in unspoiled nature. The Western Shores can be reached via the Dukuduku Gate, 2 km after the exit to St. Lucia. My favorite activity amongst the St. Lucia excursions. Cape Vidal is located 35 km north of St. Lucia and is located in the Eastern Shores of iSimangaliso Wetland Park. It’s a nice place for a relaxing beach holiday: high dunes and wonderful, extensive beaches. Due to an upstream reef, there are also excellent opportunities for swimming, snorkeling and diving. The down site, there are no nets protecting from sharks. In December you might be lucky and witness sea turtles coming ashore to lay their eggs; a very special experience. Put on your hiking boots if you are up for it. 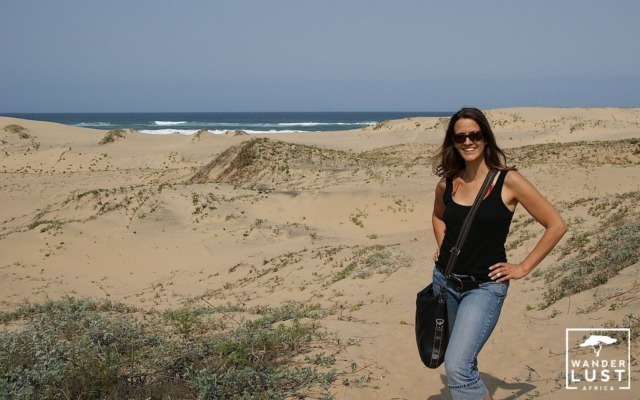 Cape Vidal offers some great hiking opportunities. You can reach Hluhluwe-iMfolozi national park within an hour from St. Lucia via Nyalazi Gate. This park was declared a natural reserve in 1895 and is one of the oldest national parks in Africa. 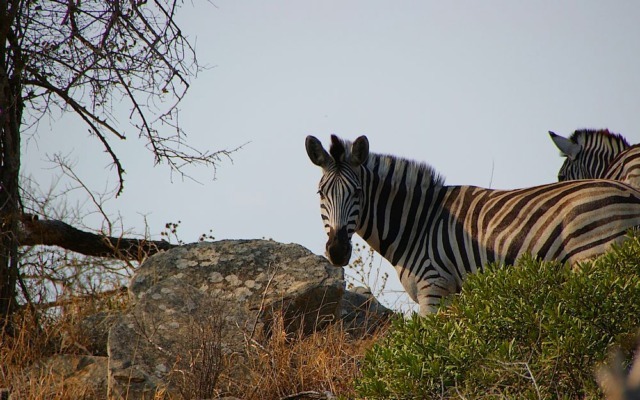 The gentle hilly landscape and original African savannah are home to the Big Five, which includes rhinos, elephants, lions, buffaloes and leopards. You can also observe a variety of other wild animals. The park is also home for white and black rhinos. Immerse yourself in a dreamlike colorful butterfly world. This interesting project not only explains how to protect the habitat for butterflies, it’s also a valuable social contribution to the local community; the entrance fees are an important source of income for the community. If you want to learn more about how to turn your own garden into a small butterfly paradise, then it’s a must visit. And kids do have fun to watch hundreds of caterpillars and butterflies swirling around. The Butterfly House is located a few kilometers west of St. Lucia and is located on the main road to Mtubatuba. Between June and the end of September, you have the opportunity to experience humpback whales. Advantage Tours in St. Lucia offers trips to whale watching. Please note that it is often a rough ride onto the sea. Therefore, small children as well as people with neck and back injuries are not taken. There’s a more gentle ocean launch at the port of Richard’s Bay; but this is about 82km from St. Lucia. Between November and March, you can take part in a Turtle Tour through Extreme Nature Tours & Travel. With an experienced ranger, you can take a walk along the beach and learn more about the nesting habits of the turtles. With a bit of lucky you can spot tiny baby turtles. Please note that it’s a walking experience. No vehicles are used on the beach. If you do not see turtles, you will receive 50% of your fees back. 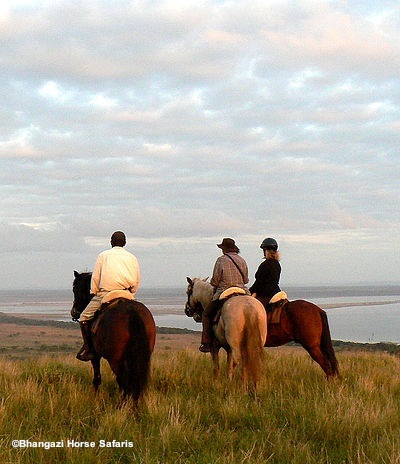 Bhangazi Horse Safaris offers safaris on horse back of different lengths. Anyone who is older than 6 years and weighs less than 100kg can participate in this fun activity. The focus is either on beach rides or bush rides. It’s also possible to book a bush and beach combo with a duration of 2.5 hours. The Mkhuze Fig Forest is located in the Mkhuze Game Reserve. The park has only one entrance. Access is via the small village of Mkhuze, 25 km from the park entrance. Please note that the roads are relatively rough and usually in bad condition; but a off-road vehicle is not required. The Fig Forest will amaze you with its rich bird life and huge fig trees – some with a diameter of 12 meters. The trees have elaborately supported trunks and a yellow bark, which gives them a shiny appearance. You can easily explore Mkhuze with your car. For a more intense experience, go on the 3 km long Fig Forest Walking Trail starting at Nsumo Pan parking. Take a Hippo & Croc Tour with Advantage Tours on Lake St. Lucia. From the boat you can observe hippos and crocodiles in the river. With some luck you might also see some elephants and other wildlife coming to the river to quench their thirst. A great sunset is all-inclusive. If you prefer something more adventurous, then you have the option of booking various kayak tours of different length through Kayak Safaris. What’s one of your favorite St. Lucia excursions?